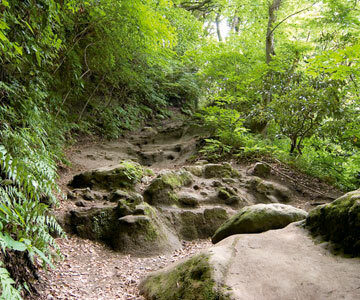 "Kiridoshi" passes bear symbolic testimony to the samurai's active intervention on the natural landforms in Kamakura and the development of it as a defensive seat of the government. These passes were the land traffic routes of "Kamakura surrounded by mountains on three sides", which were constructed, using special civil engineering methods: a mountain ridge etc. were vertically dug down and the base was used as a road. They also functioned as important defensive strongpoints that constituted an effective defense system. Asaina Kiridoshi Pass is located approximately 2.8 km east from Tsurugaoka Hachimangu Shrine and extends from Kamakura City to Yokohama City (Kanazawa Ward). It was constructed to connect Kamakura and Shomyoji Temple [K], a stronghold in the east, as part of the development of a seat of the government that put special emphasis on defense. The existing"kiridoshi" pass extends for approximately 0.9 km and the road in nearly all areas is constructed by cutting down a slope almost vertically. In particular, at "O-kiridoshi" (big kiridoshi) located at the border of Kamakura and Yokohama City there is an artificially crafted cliff remaining as high as approximately 18 m even today; at "Ko-kiridoshi" (small kiridoshi) located on the Yokohama City side there remains an artificially crafted cliff as high as approximately 16 m. In addition, in the surrounding areas of the "kiridoshi" pass, numbers of archaeological remains such as "yagura" caves, "kirigishi" cut-cliff, and manmade flatlands are preserved in good condition together with the old landform. Based on the Azumakagami, Asaina Kiridoshi Pass was constructed under the supervision of the third regent Hojo Yasutoki himself in 1241。 During the Edo Period, the pass was frequently used as a tourist route from Edo to enter into Kamakura via Kanazawa. Large-scale repair work was conducted during the early 19th century and the present "kiridoshi" pass retains the condition which was prepared at that time. Jyuniso, Kamakura-shi/Asahinamachi, Kanazawa-ku, Yokohama City. Nagoe Kiridoshi Pass is located approximately 2 km south-east from Tsurugaoka Hachimangu Shrine and extends from Kamakura City to Zushi City. It was constructed on an important road from Kamakura toward the Miura Peninsula via Zushi in the south-east. Although the present "kiridoshi" pass extends approximately 0.5 km in total, there are spots where the pass shows zigzags near the border of Kamakura City and Zushi City and near the exit on the Zushi side, there is a cliff surface of approximately 10 m in height. Therefore, the structural characteristics of this pass considering the defensiveness have been retained. In addition, "yagura" caves including Mandarado Yagura Caves are densely distributed in the surrounding areas. The Mandarado Yagura Caves are developed in 3 to 4 rows of stages extending approximately 100 m on a precipice surface which was created by almost vertically cutting down a slope declining from a ridge at an altitude of approximately 80 m down to the south-west. More than 160 "yagura" caves have been identified until today and another buried row of "yagura" stage has also been identified. 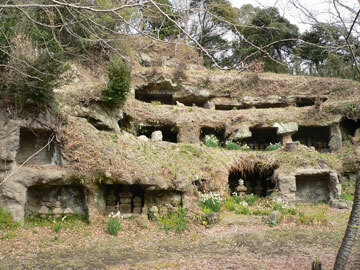 Therefore, it is a group of "yagura" caves in the largest-scale, exceeding the Hyakuhachi Yagura Caves. 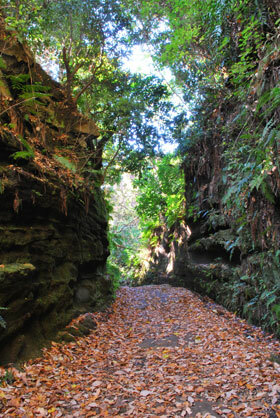 This group of "yagura" caves tend to be strongly congregated in particular. The way all-scale "yagura" caves of several square meter floor space open up on stages produces unique funereal space in combination with large numbers of enshrined five-wheel pagodas. The sight is overwhelming. Based on the description in the Azumakagami, it is considered to be opened by the early 13th century. It was used up to the early 19th century as a main road that connects Kamakura to Yokosuka and Miura, similarly to Asaina Kiridoshi Pass. 5 and 7 Chome Omachi, Kamakura City/7 Chome Kotsubo and 9 Chome, Hisagi, Zushi City. *The Mandarado Yagura Caves are now under maintenance to open to the public. Kamegayatsuzaka Pass, located approximately 1.2 km north of Tsurugaoka Hachimangu Shrine , is a"kiridoshi" pass that was built to connect Yamanouchi, where Kenchoji Temple and Engakuji Temple are located, with the central area of Kamakura and it is still in use as a community road today. 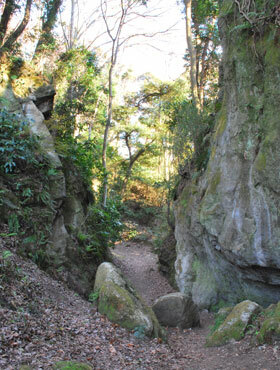 Near the summit of the "kiridoshi" pass, a cliff of approximately 20 m in height was created. This indicates that large-scale "kiridoshi" pass development was conducted. 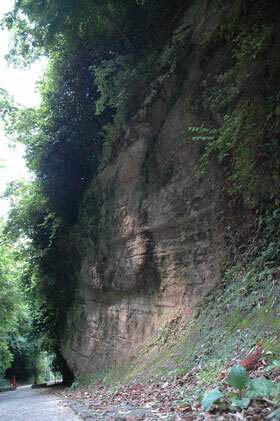 In addition, cliffs of 2 to 3 m in height are built continuously on the south side for approximately 100 m.
It is unknown when the "kiridoshi" pass was opened. According to the Azumakagami the 2nd shogun Minamoto no Yoriie fell from a horse "near Kamegayatsu" on his way back from Yamanouchi. Therefore, it is considered to be used as a road already at that time. Kewaizaka Pass, located approximately 1.4 km south-west of Tsurugaoka Hachimangu Shrine, is a "kiridoshi" pass that was built to open a route from Ogigayatsu leading to Kanto region. The extant part of the pass, extending over a length of approximately 0.5 km, was constructed by scraping off one side of the slope. In addition, there remains vestiges left by acts of scraping off the mountain on a large scale and many "yagura" caves along the "kiridoshi" pass. This defense system was proved fully in reality in 1333 when Kamakura became a battle field. Nitta Yoshisada and his brother Wakiya Yoshisuke were forced to detour, as recorded in Taiheiki (Chronicle of the Great Peace). 4 Chome Ogigayatsu and Yamanouchi, Kamakura City and others. Daibutsu Kiridoshi Pass is located approximately 2 km south-west from Tsurugaoka Hachimangu Shrine and approximately 0.4 km north-west from Daibutsu (Great Buddha) of Kamakura [G]. It is located at a place where one of the main roads from Kamakura toward the direction of Kyoto goes over a mountain in the west part of Kamakura. The present "kiridoshi" pass extends for approximately 0.5 km in total along the ridge which stretches east-west. 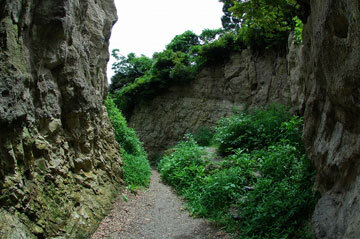 In its vicinity, channels and manmade flatlands remain and some of them accompany "yagura" caves. It is unknown when the "Kiridoshi" pass was opned. However, it seems that it had been opened already before Daibutsu (Great Buddha) was built in 1238. Tokiwa, 4 Chome Hase and 6 Chome Fueda, Kamakura City.